Of course, grandpa was full of it – so much so that, at first, it was tempting to give Narcosis a bad score. What a terrible mistake that would have been. 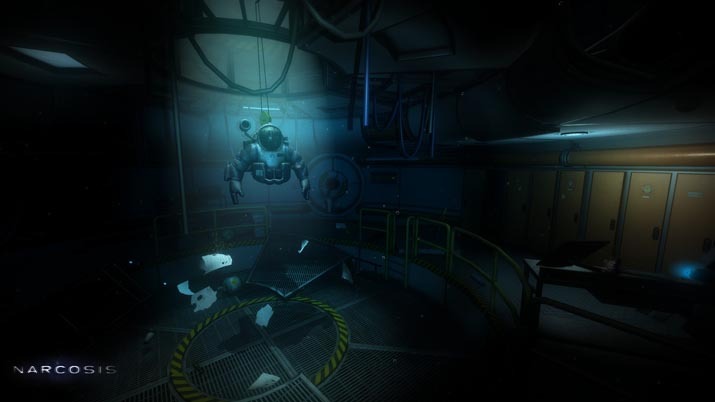 Narcosis has some niggling flaws, but for any faults, Nacrosis more than makes up, with a beautifully crafted tale of a man frantically trying to survive after an undersea disaster at a methane mine. Yes, there are some jumping puzzles, and they can be annoying in a giant, clunky suit. Your thrusters give you long, slow leaps through the water, but they flail impotently if you are up against a small ledge or pebble. Luckily, jumping puzzles are kept to a minimum, and they become relatively easy (once you master the strange controls). This title is marketed as survival horror, and the initial scenes are true to the genre. There is a jump scare – and, fine, I jumped – but this is pretty low on the scale of skillful and creative horror elements. And the shaking-face-with-weird-eyes cliché: that old chestnut forcing itself onto your screen doesn't help. It worked the first time a horror game did it; now, it’s just old. 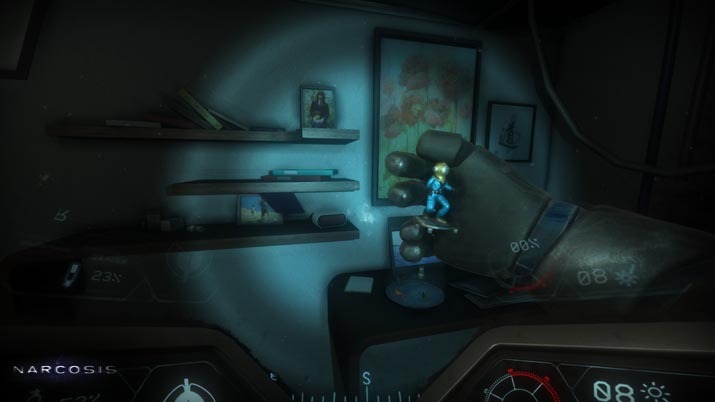 Then, there’s the whole surrounded-by-objects-that-are-creepily-human-but-inanimate trick. This first appeared in Condemned (I believe), when you enter a dead-end lined with mannequins, then turn around and the mannequins have suddenly closed off your escape. It was scary then, but Narcosis repeats this device two or three times, and you grow tired of it. Frustratingly, there are some parts of Narcosis where you simply don't know what to do, where to go. This is partially intentional, because much of the thrill comes from the race against the clock: if you run out of oxygen, you’re dead. However, there is one particular part of this release, very near the end, where enemies are closing in, and it is nearly impossible to guess how to proceed. After at least fifteen tries, I finally discovered that the answer was… flail around and button mash? Finally, there are times, especially near its beginning, when Narcosis tries too hard; the mechanic in which the more frightened you become, the more rapidly you use oxygen is interesting for gameplay, but it can feel hand-holdy, like the game is telling you when to be scared. This is totally unnecessary, because fear abounds without these reminders. None of this, however, compares to the overwhelming good. Despite the banal beginnings, likely included to hook fans of the survival horror genre, Narcosis manages to push through, and proceeds to come into its own. Jump scares become organic, from the machinations of AI rather than a contrived script, and the horrific aspects of this release are distinguishing among titles in the genre. 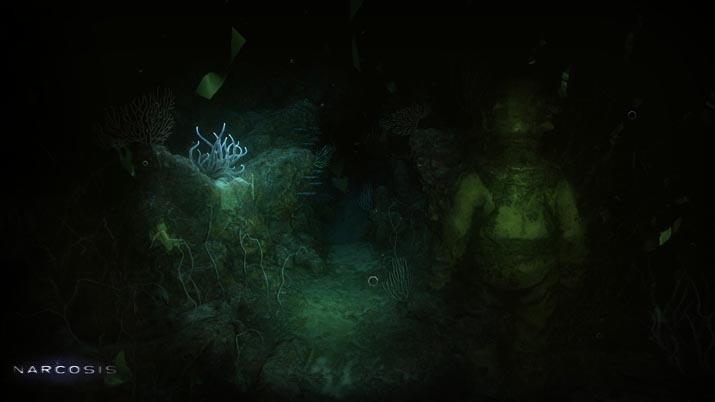 Psychological horror itself is nothing new; plodding around the murky depths of the ocean is. The mechanics are simple: You must constantly replenish your oxygen, you have some flares for light, and you have a nearly ineffective multi-tool knife. Narcosis manages to combine these pieces into something amazing. With headphones , the sound effects and music close in on you, and you feel the weight, the massive pressure of the ocean overhead. Honor Code delivers on quality details, such as the eerie sound of your own heavy and deliberate footsteps, with aplomb. 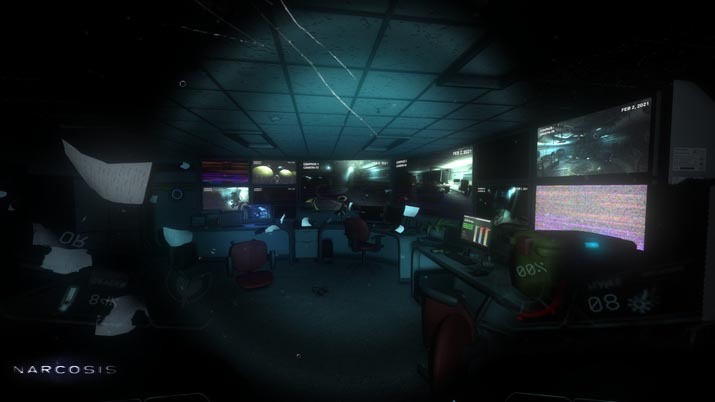 Where most survival horror titles need to rely on zombies to creep you out, Narcosis utilizes the natural world, including undersea monsters, to send your heart racing. Inevitably, the psychological aspect wears on the protagonist, and choses étranges begin to appear. Eventually, you lose track of the brackish boundary at which the nightmare ends and reality begins. That brings us to the excellent plot. These days, there are few cases where you can say the that the writing in a video game was the best part. Narcosis takes a great concept, adds a stellar plot, and tops it off with voice acting that is on-point. The narrator says poetic things at the right times to keep you thinking and second-guessing. Sometimes you trust him, sometimes you doubt him, and sometimes you hate him – only to go back to trusting him again. There are collectibles along the way which flesh out the background of the engineers and scientists that crewed the undersea structures, and these collectibles provide a natural, welcome context to the curious mind. The plot isn’t straightforward or predictable, and the end result is thoroughly satisfying. The pacing is also skillfully thought out. At about the mid-point of the game, there is a refreshing respite from the gloom and pressure of the ocean floor for just long enough to give you a break – then the deves plunge you back into their worrisome, watery world. Finding items also allows you to take a short break to read about the characters, but this respite doesn't detract from the flow of the title. And then there's the ending. The finale makes the entire experience worth it. The denouement leaves you with goosebumps, thinking about what you just witnessed, digesting the episode as the credits scroll over a poignant scene. Completion also unlocks a feature that acts as a sort of epilogue, tying everything into a nice, conclusive package. It's a relatively short experience – four to six hours, maybe – but it is the perfect length for the story that the creators wanted to tell (not to mention the limits of the gameplay itself), and you have to admire the Honor Code crew for not dragging it out. Although Narcosis is "the debut effort" from Honor Code, the developers boast experience with legendary AAA games, and it shows. The Honor Code team has successfully crystallized their knowledge and skills, and put together an impressive work of art indeed - I look forward to their next project. Narcosis is not without its flaws, but the level of care in this title is salubrious.The alternatingly terrifying and psychologically taxing atmosphere, paired with storytelling that keeps you rapt until you arrive at the beautiful conclusion, proves a must-play for gamers.